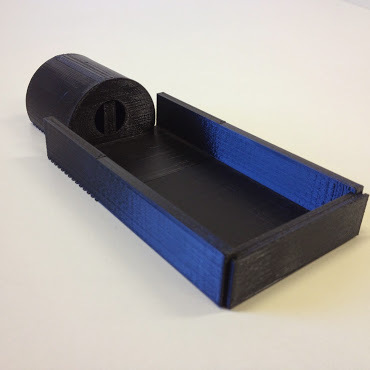 This project is a a 3d printed I phone 5s cradle with a charging stand. The idea was born through my first project. 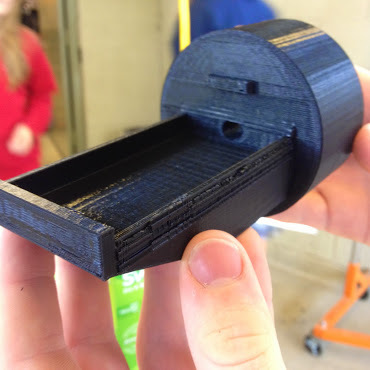 The only materials used to make it were the app 123D design, plastic and time. 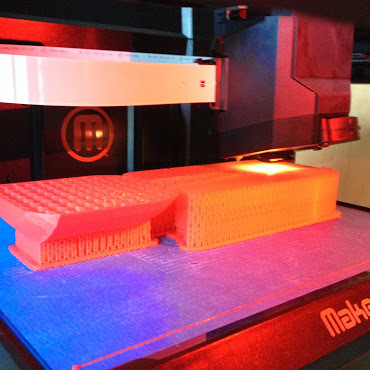 The tools that I used were the Maker Bot Replicator and an Mac Book Pro. When my first model was printed the connecting stubs were too short and the holes were too small. The design could not stand properly. Those problems took a long time to fix but i managed it. The part that was the most fun is watching it print. I still do not believe that I can make anything.I did not have to learn to use any new tools due to the fact that I had used 123D design before for my first project. I originally wanted to build my design as one piece. Mr. Umekumbo suggested I build attachable pieces. That was a very good idea. I came up with the idea on my own. I just always wanted one so I made it. If I had the time and resources I would build in a solar charger to the back so it would charge on its own. I had a lot of fun with this project. Project reflection - 3d printed charger. 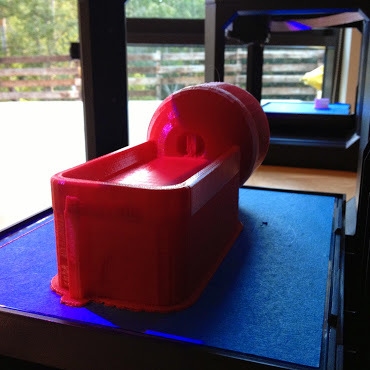 For this project I built a iPhone charger/cradle using 123D design. There is a hole for the charger and an opening so that it can plug into the phone. It is made of plastic and it took a long time to build. I made 4 prototypes. It has a huge circular base and a phone like shell with a support. The hardest part of the project was trying to get the dimensions perfectly right so the phone would be in the cradle with enough room to leave but not enough to slip. In the end I reached my goal though. It looks really cool and the phone fits. The part that was the most fun and interesting was using commands that curve edges. I liked this because it made everything look so awesome. From this process I learned 4 things. 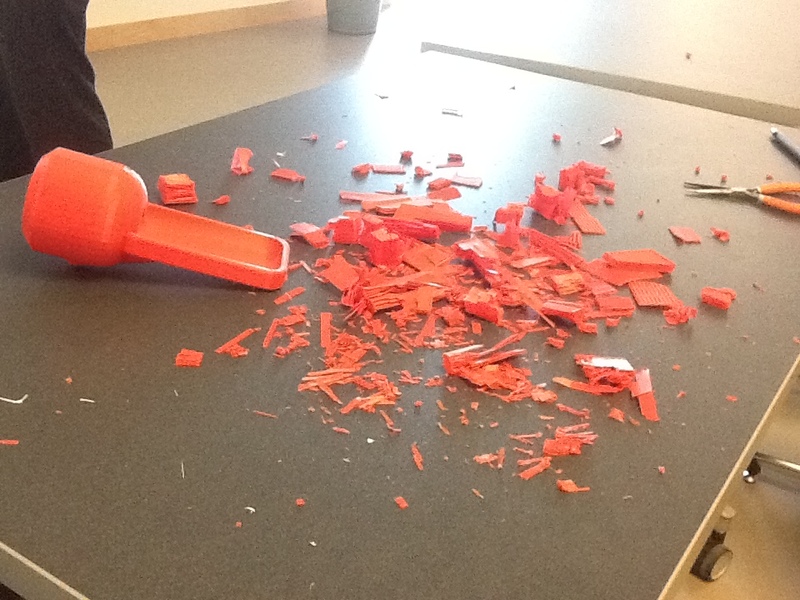 I learned how to use 123D design. I also learned hoe to scale something properly and how to develop ideas diligently. If I could do this again I would make it so their were holes in the body so the cord would not get tangles. Last but not least I learned that I love designing in 3D and that i will do it again soon. For this project my friends max and I built a small robot "Car" using a hummingbird. We used a movement sensor so our robot could follow us. The base of our robot was built from many things including circuit boards, old calculator shells and hard drives. It has two wheels at the back and a piece of plastic at the front. The wheels are consisted of servo motors, specialized humming bird wheels and rubber bands. Out car had a green light and a red light. The hardest part of the project was remembering to save the code. I forgot to save it 3 times. Each time I had to rewrite it. In the end we reached our goal though. When my hand moved left the car also moved left. When my hand moved right the car also moved right. The part that was the most fun and interesting was unscrewing the old calculator, removing all the old circuits, in order to make a cool base for our car. From this process I learned 3 things. I learned that taking things apart is fun no matter how old you are. I also learned that coding a hummingbird is not as hard as I fought. If I could do this again I would build A better looking body out of cardboard. Last but not least a learned that when you are programming things there is always a new or different way to get close to your original goal and outcome. 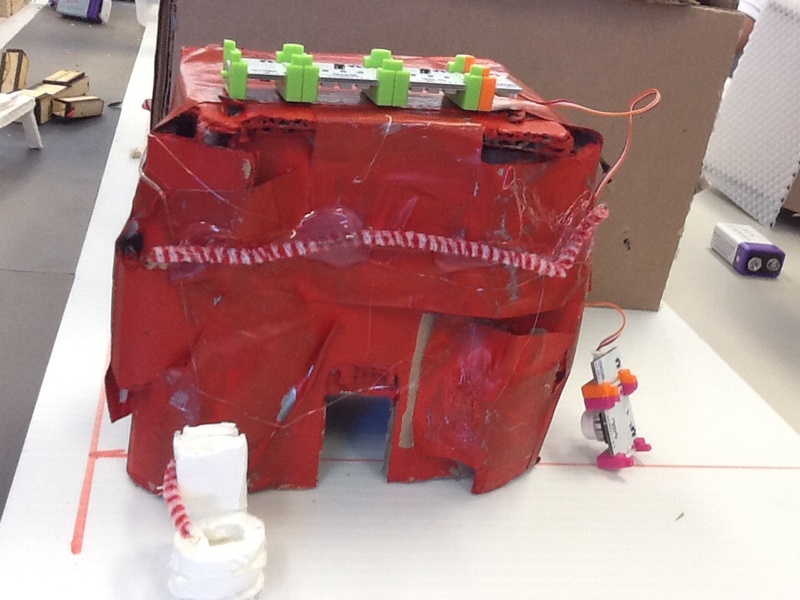 This project was about getting a nerf gun to short at people as soon as it sees them using aurduino and a servo motor. I wanted to put in my door way so when people came in the house they would get shot! It took me a lot of materials though. I used wood, wire, a nerd gun, rope, aurduino, servo, and glue. To properly influence these materials i used many tools. I used saws, drills, scissors, computers, glue guns, and a soldering iron. The most challenging part of my project was when i had to 3d print a new servo arm and it didn't fit. The most fun part was shooting Gabe in my presentation. I used instructables.com and the code links from the instruct able page. I had lots of absolutely perfect pictures but i lost them when my I-pad broke. Lumino city is one of our first projects in Creators Studio. The aim of Lumino City is to build a house and implement little bits (a beginners circuit) into the house to make lights, moving parts, noise, or some sort of sensor. I built my house out of cardboard. I cut holes in the sides that the other sides would fit into. I then taped it together, cut out a door, and painted it red. I also hot glued a decoration over the front door. I also made a cute tiny toilet for the entire community. The mechanics are a battery-power-button-wire-light-light-light. This is unrealistic because their is no way to make a loop. It was a really fun project.